Speaking of songs I like that aren’t in fake books, here’s a Jimmy Van Heusen song first recorded by Bing Crosby in 1943. 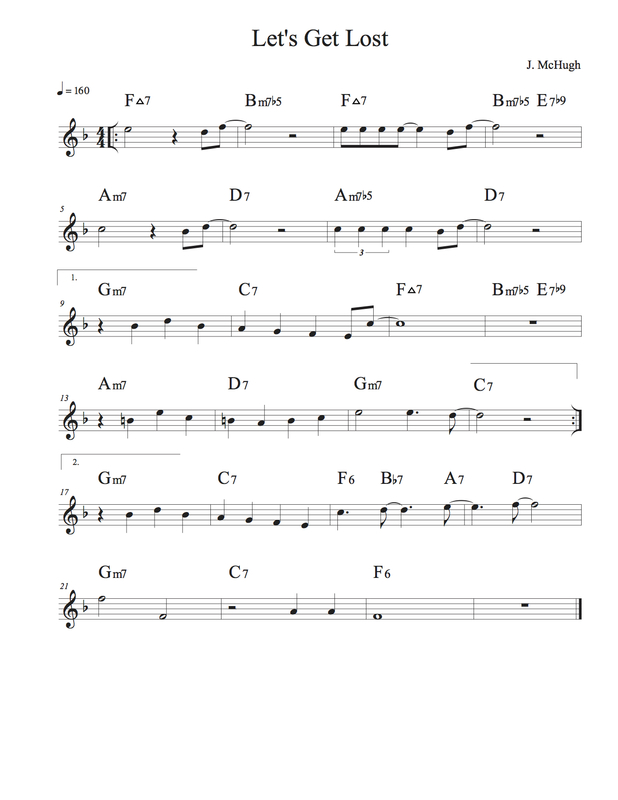 This entry was posted in Uncategorized and tagged It's Always You, jazz, lead sheet, music, Noteheads, transcription on January 25, 2018 by noteheads. I thought this Jimmy McHugh song was a relatively well-known standard, but it isn’t in any of my fake books. Chet Baker uses a slightly different set of chord changes; I’ve included those below. This entry was posted in Uncategorized and tagged Chet Baker, jazz, lead sheet, Let's Get Lost, music, Noteheads, transcription on January 17, 2018 by noteheads. I had some unexpected free time last week, so I decided to tackle a song that sneaks into my thoughts from time to time. Egberto Gismonti is a prolific and versatile composer. A look through his extensive discography finds him playing rock, jazz, folk, chamber music and more. His 1991 album Infância is a collection of mellifluous pieces for cello, guitars (or piano) and bass. The music is sometimes somber, sometimes joyous, and always has a rhythmic flair that is distinctly Brazilian. This entry was posted in Uncategorized and tagged Brazilian, Egberto Gismonti, Meninas, music, Noteheads, score, transcription on January 9, 2018 by noteheads. Happy new year! Hope your 2018 is happy and healthy. Here’s one from Freddie Hubbard. This entry was posted in Uncategorized and tagged Freddie Hubbard, funk, Happiness is Now, jazz, lead sheet, music, Noteheads, transcription on January 1, 2018 by noteheads.